Training information and guidance on burn pits “throughout Iraq, Afghanistan, and Djibouti” was provided by the Department of Veterans Affairs to all VA Regional Offices in 2010. To provide “fact sheets” that may serve as valuable resources for VA examiners when they conduct Compensation and Pension (C&P) examinations associated with these exposures. It’s important for veterans who were affected by burn pit exposure during active duty service to know how the VA is guiding its employees to handle the associated claims. 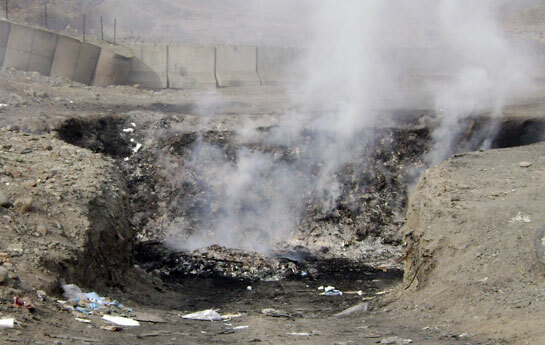 General Information: Throughout the current contingency operations in Iraq and Afghanistan (from approximately 2001 to the present), the U.S. Military utilized large burn pits to dispose of waste. Burn pits are located at every location wherein the military has positioned a forward operating base (FOB). This includes the major US military staging base in the country of Djibouti on the Horn of Africa. Exposure to open burn pits has created significant concern among Veterans and their families. The most widely publicized of these is the burn pit at Joint Base Balad. The air base at Balad, also known as Logistic Support Area (LSA) Anaconda, is located in Northern Iraq approximately 68 kilometers (km) north of Baghdad and 1.5 km from the Tigris River. It occupies a 25-square kilometer site and is home to approximately 25,000 military, civilian, and coalition personnel. According to the U.S. Army Center for Health Promotion and Preventative Medicine (USACHPPM), the amount of solid waste burned at Balad was estimated at about 2 tons of material per day in the early stages of troop deployment and increasing up to several hundred tons per day. The Balad burn pit occupies approximately 10 acres. The burned waste products include, but are not limited to: plastics and Styrofoam, metal/aluminum cans, rubber, chemicals (such as, paints, solvents), petroleum and lubricant products, munitions and other unexploded ordnance, wood waste, medical and human waste, and incomplete combustion by-products. Jet fuel is used as the accelerant. The pits do not effectively burn the volume of waste generated, and smoke from the burn pit blows over the Air Base and into living areas. DoD has reported to VA that as of October 2009, the Balad burn pits were shut down and incinerators were installed. Burn pits still operate at many other bases. DoD has performed air sampling at Joint Base Balad, Iraq and Camp Lemonier, Djibouti. Most of the air samples have not shown individual chemicals that exceed military exposure guidelines. The air sampling performed at Balad and discussed in an unclassified 2008 assessment tested and detected all of the following: (1) Particulate matter; (2) Polycyclic Aromatic Hydrocarbons; (3) Volatile Organic Compounds; and (4) Toxic Organic Halogenated Dioxins and Furans (dioxins). Polycyclic Aromatic Hydrocarbons. Polycyclic Aromatic Hydrocarbons (PAHs) are a group of over 100 different chemicals that are formed during the incomplete burning of coal, oil and gas, garbage, or other organic substances. Some of the PAHs that were tested for and detected are listed below. These results are from DoD testing at Balad from January through April 2007. Volatile Organic Compounds. Volatile Organic Compounds (VOCs) are emitted as gases from certain solids or liquids. They include a variety of chemicals, some of which may have short- and long-term adverse health effects. VOCs are emitted by a wide array of products numbering in the thousands. Examples include: paints and lacquers, paint strippers, cleaning supplies, pesticides, building materials and furnishings, office equipment such as copiers and printers, correction fluids and carbonless copy paper, graphics and craft materials including glues and adhesives, permanent markers, and photographic solutions. The following list reveals some of the VOCs that were tested for and detected at Balad. These results are from DoD testing from January through April 2007. **Acrolein and Hexachlorobutadiene were occasionally detected far above the MEG ratio—once over 1800 percent above the MEG for Acrolein and over 500 percent above the MEG for Hexachlorobutadiene. Toxic Organic Halogenated Dioxins and Furans. Dioxins are well known to VA because of their association with tactical herbicide use in Vietnam. Below is a list of the dioxins and furans detected at Balad from January through April 2007. Currently, VA is not able to determine what possible adverse synergistic health effects might be caused by a combination of (1) high levels of particulate matter; (2) numerous Toxic Organic Halogenated Dioxins and Furans; (3) known and unknown Polycyclic Aromatic Hydrocarbons; and (4) known and unknown Volatile Organic Compounds. For example, 22 of the foregoing toxins, not including dioxins and particulate matter, adversely affect the respiratory system; at least 20 affect the skin; at least 12 affect the eyes; and many others affect the liver, kidneys, central nervous system, cardiovascular system, reproductive system, peripheral nervous system, and GI tract.8 In at least seven of the foregoing toxins (VOCs and PAHs), dermal contact can significantly contribute to overall exposure.9 Many troops may have also ingested various amounts of these toxins through food sources because of smoke plume dispersion through base facilities. Because of the widespread nature of the burn pits and the inability of military personnel records to identify all duty locations, the Veteran’s lay statement of burn pit exposure generally will be sufficient to establish the occurrence of such exposure if the Veteran served in Iraq, Afghanistan, or Djibouti. Regional office personnel must also be aware that many Veterans suffering from illnesses such as, respiratory, cardiopulmonary, neurological, autoimmune, and/or skin disorders, may not associate such conditions with burn pit exposure. Such exposure may have been an accepted fact of life inside the theater of operations. Further, if toxin exposure is raised by a Veteran, he or she will generally not be aware of what toxins were released by burn pits. Rating authorities must therefore be prepared to actively review such claims by recognizing potential exposure issues whenever they are reasonably raised by the record and then developing those claims in accordance with instructions herein. Verifying and/or conceding exposure is one of the key elements in the adjudication process. VA is actively working with DoD to identify individuals who were exposed to specific environmental hazards while serving in the military. In most cases, it will not be possible to refer to a list of service members present at a specific location. It is critical that VA employees rely upon all available sources of evidence when verifying and/or conceding exposure. Currently, C&P Service has only acquired a list for those who served at the Qarmat Ali Water Treatment Plant in Basrah, Iraq. For other incidents, if exposure cannot be verified through an official list provided by DoD, then personnel records should be reviewed for evidence that corroborates the Veteran’s statement of exposure. IMPORTANT: Service Treatment Records, to include the Post-Deployment Health Assessment (PDHA) and Discharge Examination, should be carefully reviewed for exposure information. The PDHA includes specific questions relating to exposure incidents. Because military service records will not verify all incidents, if any, of exposure, alternative evidence such as personal statements, buddy statements, unit histories, news articles, or other lay evidence shall be considered in establishing whether the Veteran participated in or was affected by an in-service exposure incident. Exposure may be verified or conceded, if the statements provided by the Veteran and/or others are consistent with the facts, places, and circumstances of the Veteran’s service. 38 U.S.C. § 1154(a); 38 C.F.R. § 3.303(a). 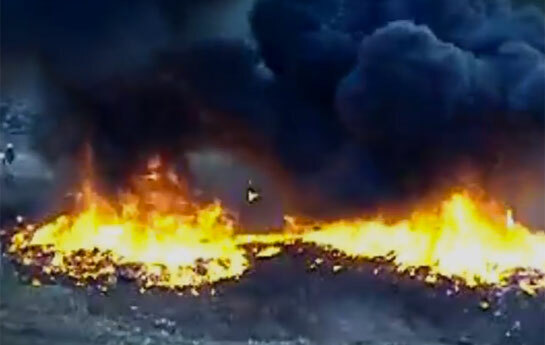 Because of the widespread nature of the burn pits, and the inability of military personnel records to identify all duty locations, the Veteran’s lay statement of burn pit exposure generally will be sufficient to establish the occurrence of such exposure if the Veteran served in Iraq, Afghanistan, or Djibouti. For example, a Veteran who performed guard duty at a burn pit in Iraq would have been subject to potentially higher levels of toxic exposure than someone who did not perform such duty. The Veteran’s service records will generally not provide that level of detail necessary to show that he/she performed that particular duty. Thus, if the statements provided by the Veteran and/or others are consistent with the facts, places, and circumstances of his or her service, then concede them as a fact of record. See Id. (Do not confuse this section with the provisions found at 1154(b)—applicability of 1154(a) does not require evidence of combat). Further, in applying section 1154(a) to concede a Veteran’s exposure to burn pits and PM specifically, it is important to remember the information contained in section 1.A. and 1.B. of this Training Letter. Essentially, that VA is aware, primarily through cooperation with DoD, of the extent of potentially hazardous exposures (i.e., elevated PM levels throughout Iraq, Afghanistan, and Djibouti; as well as burn pits located at all military FOBs in these same regions). Therefore, VA is aware of the “facts, places, and circumstances” of a Veteran’s service in those regions. Going beyond section 1154(a) by requiring proof of exposure, such as by service personnel or unit records, could arguably violate section 1154(a). The resulting interplay between VA’s knowledge of exposure and section 1154(a), results in easily conceding exposure without an actual “presumption” of exposure. 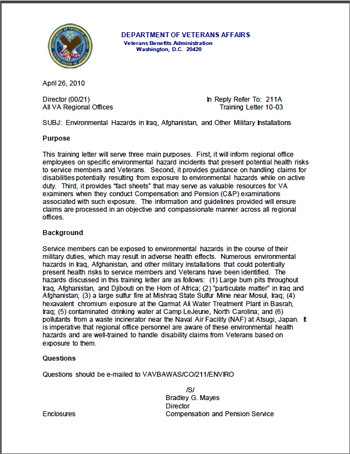 Note: Because Veterans generally will not possess the type of exposure information contained in this training letter, regional office personnel should be aware of the environmental hazards that may apply for Veteran claimants who served in Iraq, Afghanistan, or Djibouti, even if the claimants did not allege such exposure, (e.g., Particulate Matter exposure). Be aware also that more than one environmental hazard may apply when Veterans are alleging exposure to a specific event. For example, if a Veteran claims a disability due to exposure at the Qarmat Ali Water Treatment Plant, each pertinent Fact Sheet should be provided to VA examiners, as explained below, since the Veteran served in Iraq and could have been exposed to burn pit emissions and the same high levels of particulate matter as others in the Southwest Asia theater of operations. Reminder: Generally, VA examinations are ordered for all claims received within one year of separation from the military, unless the evidence is sufficient for deciding the claim. This includes a general medical examination and any specialty examinations deemed necessary. • Element 1: Evidence of a current diagnosed disability or persistent or recurrent symptoms of disability. • A claimant ordinarily lacks the medical training and experience to diagnose his/her own medical condition or offer a medical opinion. However, a claimant is competent to describe symptoms of disability that he/she is experiencing, (e.g., shortness of breath, coughing, fatigue, skin rash, etc.). Therefore, medical evidence of the claimed disability is not necessary to trigger the VA examination request as long as the claimant describes persistent or recurrent symptoms of the claimed disability. • Element 2: Evidence that the veteran was exposed to an in-service exposure event or incident, including a Veteran’s lay evidence. For the purposes of this element, exposure to certain environmental hazards can be conceded, on a case-by-case basis, as previously discussed. • Element 3: Evidence that the claimed disability or symptoms may be associated with the in-service exposure event. • In determining whether a claimed condition may be associated with an in-service exposure incident and therefore warrants a VA examination or opinion request, you must consider the information herein to determine if the Veteran’s symptoms may be representative of an illness or disease linked to a specific exposure. Because the scientific studies to identify health effects of exposures are in the preliminary stages, C&P Service is providing general guidelines as to what type of symptoms trigger a VA examination or opinion. If in doubt, regional office personnel should err on the side of the Veteran when determining if a VA examination or opinion is needed. If that doubt exists in any degree, then evidence of a current disability (or symptoms of a disability) is sufficient to request a medical examination and medical nexus opinion if the proper service is verified and no evidence exists of subsequent cause for the disability. • Regional office personnel should carefully review lay statements that may provide evidence that shows continuity of symptoms from service to the present. In cases where evidence showing continuity of symptoms is strong, medical examinations/opinions may not be necessary. In others, it may serve as evidence that a claimed condition may be associated with an in-service exposure event(s). Ultimately, VA employees should remember that the threshold bar for requesting an examination/opinion is very low, but if existing evidence is satisfactory to decide the claim, then a VA examination is not necessary. When requesting medical examinations, inform the examiner of the Veteran’s service along with the location and nature of the environmental hazard in which the Veteran was exposed. When requesting examinations/opinions, always forward the claims file to the medical examiner (or appropriate material to the contract examiner) and direct him or her to review the medical and other evidence in the claims folder and provide a rationale for his or her opinion. Fact Sheets explaining the various environmental hazards are attached to this training letter. The pertinent Fact Sheets must be made available to the VA medical examiner for review. The examiner should state whether it is more likely, less likely, or as likely as not that a Veteran’s claimed condition is related to the hazardous environmental exposure. The fact sheet(s) must subsequently remain in the record. Note: The Fact Sheets are not meant to influence examiners rendering opinions concerning the etiology of any particular disability, but rather to ensure that such opinions are fully informed based on all known objective facts. It is imperative that examiners utilize this information objectively and together with other evidence, (e.g., lay statements) in the Veteran’s record. In some cases, an opinion based on record review only may be sufficient. In other cases, a current examination may be required. When an opinion only is initially requested, the examiner should be informed that an examination will be scheduled if the examiner believes it is necessary in order to render the requested medical opinion. When the opinion is completed and returned to the regional office, rating personnel should ensure that the examiner has identified the specific evidence reviewed and considered when forming the opinion, provided a rationale for the opinion, and stated his/her conclusions using one of the legally recognized phrases. When rating a disability due to an in-service exposure event, it is imperative that raters adhere to the principles relating to service connection set forth in 38 CFR § 3.303. Because scientific studies regarding health effects from exposures are in the preliminary stages, raters should carefully review the nature, dates, and locations of the Veteran’s military service, and apply the law under a broad and liberal manner, consistent with all available facts and circumstances. Claims should be evaluated on a case-by-case basis with evidentiary weight given to medical examinations and opinions from both private and VA physicians. In all cases, the benefit of the doubt shall be given to the Veteran. 38 CFR § 3.102. • The medical evidence does not provide a sufficient link to Veteran’s military service. If the above scenario is presented, the claim should be developed under the Gulf War and Southwest Asia service procedures outlined in Training Letter 10-01, released February 4, 2010. (See “What to Include in a VA Examination or Medical Opinion Request”, above). If there are complex or controversial medical issues involved in the rating of disabilities claimed as a result of environmental exposures, an advisory opinion can be obtained from non-VA medical experts. Requests for this type of opinion are initiated by the regional office and submitted through the Veterans Service Center Manager to C&P Service for approval. The request must detail the reasons why the opinion is necessary. Note: These are special requests and not the same as requesting a VA physician to express an opinion on a VA examination. The VA notes that the Fact Sheet is not meant to “influence examiners rendering opinions concerning the etiology of any particular disability, but rather to ensure that such opinions are fully informed based on all known objective facts.” The VA asks the examiner to utilize the Fact Sheet along with other evidence in the Veteran’s record. You may download a copy of the Burn Pit Fact Sheet, which is part of the VA’s April 26, 2010 letter to its Regional Offices, here.